The New Ebac RM65 Dehumidifier. Is it one of the best dehumidifier models for water damage restoration? It's too early to tell for sure but in my review of the latest Ebac RM65 I will tell you about the new model, how it measures up to the competition and why you may want to consider it for your business or your basement. The Ebac RM65 Dehumidifier is a new model but it's a late entrant to the market for water damage restoration models with rotational molded (roto-molded) polyethylene housings. There are many water damage restoration professionals and home owners already using similar units from the Phoenix (Therma-Stor) and Dri-Eaz stables as well as a number of other brands. Phoenix and Dri-Eaz are highly respected restoration dehumidifier brands but, although Ebac have introduced their roto-molded range a little later than their rivals, this British company has a reputation comparable to its two major US competitors in this demanding segment of the market. The Ebac RM65 is designed primarily for water damage restoration professionals. It is best described as an "entry level" restoration dehumidifier which is entirely suitable for many small and medium sized projects. The RM65 lacks the sophisticated capabilities needed for some more demanding restoration work and this is reflected in the price; currently (Jan 2012) around $1200 to $1300. This unit is also suitable for a range of other commercial applications, particularly those which require a robust and portable unit which can operate effectively at lower temperatures. Roto-moulded restoration dehumidifiers are becoming increasingly popular for residential use due to their small size, low noise output (compared with some basement models), reliability, low temperature operating capability and appearance. 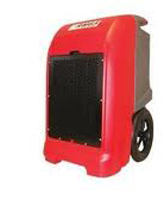 This unit is suitable for residential use in cool basements, large garages and workshops. The RM65 is recommended for use in areas with an effective volume of 8,369 cu. ft./237 cu. m). Information in this form is of most use to commercial operators but, for the guidance of residential users, this figure equates to a floor area of approximately 1200 square feet. Bearing in mind that water damage restoration projects are more demanding than residential applications the RM65 will cope effectively with a basement having a floor area of between 1500 and 2000 square feet, depending on the degree of dampness. The most direct competitor model, for both commercial and residential users, is the Dri-Eaz DrizAir 1200. There is little to choose between the two models when we look at size, weight and air flow volume for example so I will concentrate on the differences. The Ebac RM65 has a 25% higher water extraction rate; 80 ppd vs. 64 ppd. The RM65 is, currently (Jan 2012), a little less expensive than the DrizAir 1200; $1200 to $1300 vs. $1300 to $1450. No direct comparison can be made with the Phoenix range as their lower capacity roto-molded dehumidifiers, models R125, R150, and R175, have different capabilities to suit more demanding conditions and are correspondingly more expensive in relation to their water removing power. At this time the Ebac RM65 Dehumidifier has little or no track record and there are no user experiences to draw on. Ebac's reputation may give us some confidence but many water damage restoration professionals will want to wait and see before investing in this model. On paper the RM65 looks like a better buy, unless the wider operating temperature range of the DrizAir 1200 is critical to your decision, but I am not yet prepared to make any firm recommendation in its favor. Similar reservations apply when talking about domestic applications but the issue of operating temperature range is less important as most, if not all, basements will have an ambient temperature well within the capabilities of the RM65. For householders with larger basements the higher water extraction capacity and lower price of the RM65 may prove an irresistible combination. Nevertheless I will reserve a final judgement until we have some more evidence from users about the medium to long term performance of the Ebac RM65 Dehumidifier.